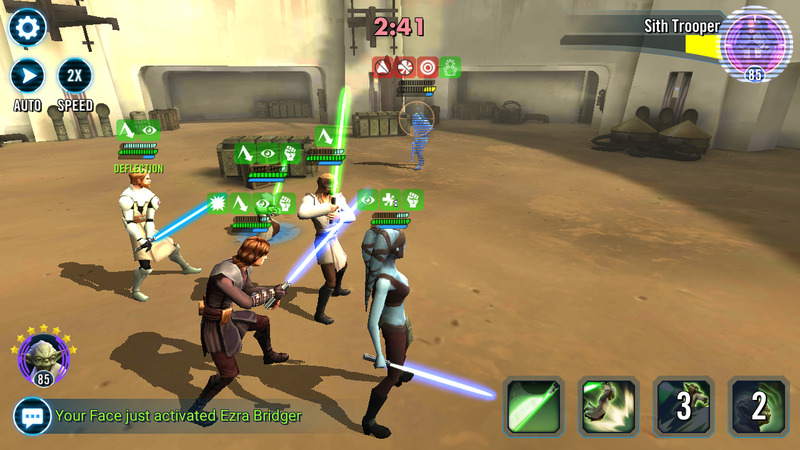 Here is my free to play jedi sticking it to a spenders sith team. Sick team by the way. What Zetas do you currently have on them? The team only has the 2 zetas. Qgj L and Yoda battle meditation. I really like Jedi teams, beacuse I don't see any in my arena. I run Empire/Sith, and hope they release DK and DT in reasonably farmable F2P locations. I'm the only Emperor Palpatine Lead in top 100. Everyone else is DN or Jynn leads ATM. Makes it easy to stay in the top 5. My only issue is a whale in #1 for the last month or so. 7 levels higher than most other players, with an endless roster. For that reason alone I only take #2 payout every day. But I welcome the competition. I think with DK and DT I can compete for #1. How well do you do against teams with Sith Trooper instead of Darth Vader? Nice. How long have you been playing? Nice video, love the song, but imo without gk you would have been severely beaten. While yes gk is ftp he is probably the hardest character to obtain. While jedi are viable, sith are actually easier to farm for ftp as the best jedi teams include gk. It's cute you think that, but you're wrong. I am curious about this as well.I'd like to see how your team does against a team with Zavage and Sith Trooper instead of EP and Vader. @Drax_77 while I don't disagree that GK makes the jedi go. I think that most F2P guys that have mature roster should have him by now. Mine is almost 7* and I'm in a 100% F2p guild. We have 2 f2p guilds and both have been doing heroics for the same amount of time. All our members except the newer ones have him. So yes a lot of the newer players might not have GK most of the senior guys should regardless whether they are f2p or not. @godgiven45 true most people that have been around for awhile, or those who have been able to join heroic guilds need nothing other than time to farm him ftp or ptp alike. But he is one of the hardest characters to farm in the game and most definitely the hardest jedi to farm. I have many times beat zqgj with my zmaul team and rather easily when they don't have gk on the squad, now you throw in gk and a fast zyoda and that's an entirely different team and I rarely beat them. My point is more that I'm not convinced it's the obvious choice meta for ftp, imo sith are easier to farm. @Drax_77 it's a good debate I just don't think most want a couple 3 or 4*s on their arena team. My two 3* toons work rather nicely on my squad! Either way if you choose jedi, Rex, sith or the newly "farmable" r1 squad it has become very viable for ftp to compete with the whales, and having more than 1 way to do it to me means the game is headed in the right direction. And if jedi get a rework the way sith did then yes I'd say they would most likely be the best ftp squad out there. I'm glad Jedi are working out well for you but to say that Jedi are the best option for F2P is simply not true. Your Jedi team is held together by General Kenobi. GK is not available for 95% of players and I'm sure that number would even lower for F2P. A Jedi team without GK is going to get SLAUGHTERED. 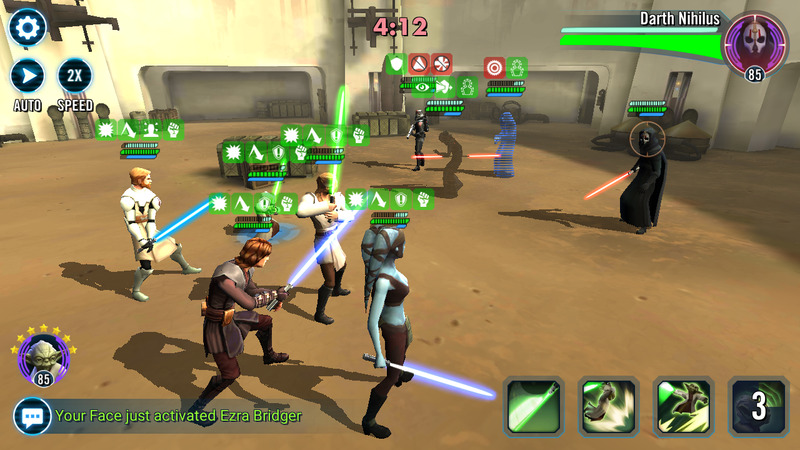 I think jedi are the obvious meta choice for the f2p right now. You can have a great Sith team without spending though, since the assassin and Nihilus are just fine at 4*. Therefore, the FTP meta is Sith but it's great to see a Jedi team can defeat it on offense.